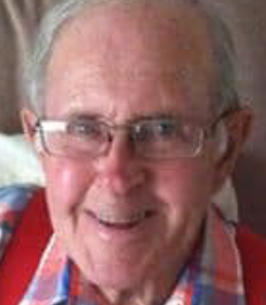 Billy James Baggett, 89, Formerly of Odessa, passed away into the arms of his heavenly father, January 30, 2019 at his home in Merkel, surrounded by family. Open visitation will be held Friday, February 1 from 8AM to 4PM at Starbuck Funeral Home in Merkel. There will also be a viewing Saturday, February 2 from 10Am to 12PM at the Sherwood Church of Christ in Odessa. Graveside services will be held at 2PM Saturday, February 2, 2019 at Evergreen Cemetery in Stanton under the direction of Starbuck Funeral Home in Merkel. Lynn Money will be officiating. Billy was born August 28, 1929 in Stamford, Texas to Selma (Haygood) Baggett and Charles Bennett Baggett. He graduated from Stamford High School and Tarleton College, where he was a member of the ROTC. He married the love of his life, Dena Quaid Baggett, on June 7, 1951. They were married for 64 years until her passing in April of 2015. Billy was one of the first four Marines to be drafted from the Big Country during the Korean War on August 15, 1951. Upon returning home, Billy and Dena lived in several parts of Texas before settling in Odessa and making it their home. He worked as a mechanical engineer for the Western Company and CRC Wireline. Billy was a member of the Sherwood Church of Christ for over 50 years, and a Member of the Merkel Church of Christ, after moving to Merkel in 2014. Billy was always a Christian example to everyone and never met a stranger. He was a brilliant mechanic and craftsman. There was nothing he couldn't build or repair. He and Dena loved building all of the crazy Christmas items that their grandchildren requested that couldn't be found in stores. These items are still cherished and are loved by their great grandchildren now. Upon retirement, Billy and Dena loved camping, especially in the valley. They enjoyed bringing fruit back to family and friends. They were both lifelong MOJO football fans and never missed a game no matter how far. They were members of the Oil Burners Antique Car Club and had so much fun displaying their all original 1955 Chevrolet Bel Air. Billy was everyone's go to expert, even after he physically couldn't do the work. He could always solve the problem. Most important to Billy however, was God and his family. Billy is preceded in death by his wife, parents, and brother Charles Baggett. Survivors include his son, Rickie Baggett and wife Margaret of Borger, daughter Melodi Hobbs and husband Ronald of Merkel. Seven grandchildren: Bryan Baggett, Ashli Myers, Stevie Jones, Treavor Hobbs, Cameron Hobbs, Lindsey Hawley and Heather Janvrin. 14 great grandchildren: Brylie, Chaney, Kambrey, and Quaid Myers, Kamdon, Swayzie and Hadley Jones, Natalee, Lexie, and Jordyn Hawley, Evan and Shelby Redd, Conner Janvrin, and Aiden Baggett. A special thank you to Billy's precious hospice nurses, especially Lana and Kate.